Sometimes I actually take the time to work on projects just for me! One of my projects in summer 2007 was sewing all the fashions from the Mary Frances Sewing Book or Adventures Among the Thimble People. This book was written by Jane Eayre Fryer and published in 1913. The book instructed young girls in the art of sewing. 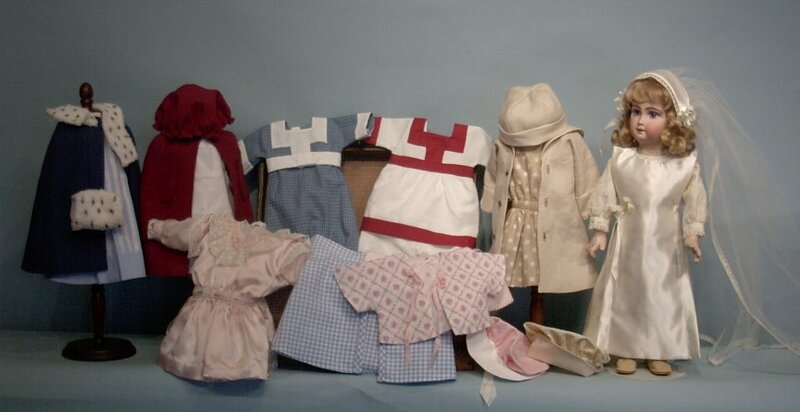 It included patterns for many outfits that these girls could sew for their dolls while they were practicing the sewing techniques taught in the book. This book has been republished and is still available (If you're interested in getting your own copy of the book, Amazon.com is a good place to look as well as online used booksellers. Make sure these new and used editions have the patterns included...some do not!). As I was choosing material, I tried to use fabric and trims that I already had on hand. Since I tend to buy pinks, blues, reds, and tans, my fabric choices are very similar to the fabrics suggested on the patterns themselves. As mentioned on my website, these Mary Frances patterns perfectly fit the Seeley's FB14J body. 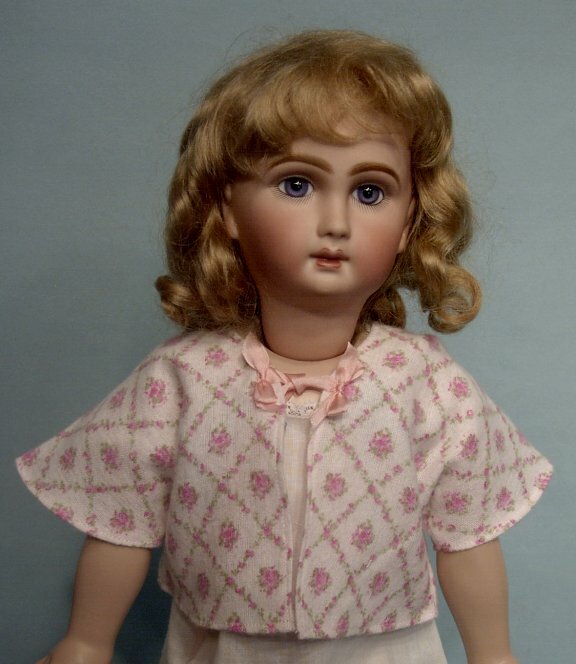 The doll modeling is a reproduction of Bebe Louvre, a Seeley's mold. Her head is on an FB14J body. When sewing all these patterns, I made just a few changes, mostly for design issues. I hardly made any changes at all for fit issues. The patterns were a true pleasure to sew and I think the outfits are quite charming! My camera hasn't really done these little outfits justice, but I hope you enjoy them! Underwear: There are cotton split Drawers (not shown), a Flannel Petticoat, and an Underwaist of cotton with a cotton Lawn Petticoat attached. All pieces are lace trimmed. 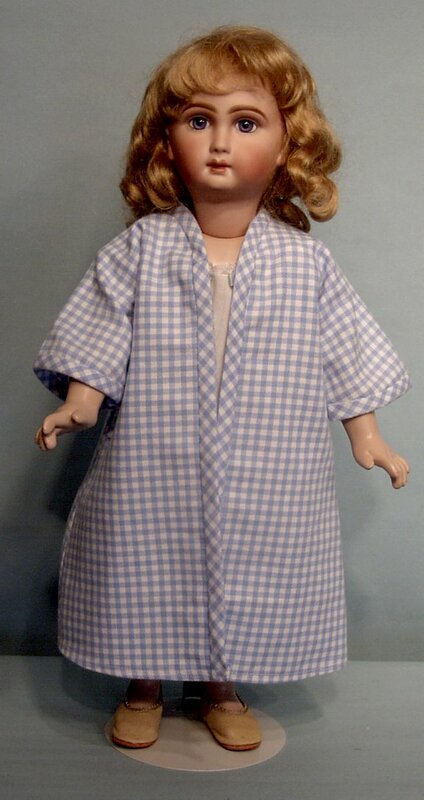 Nightclothes: Basically the same pattern is used for all of these pieces. 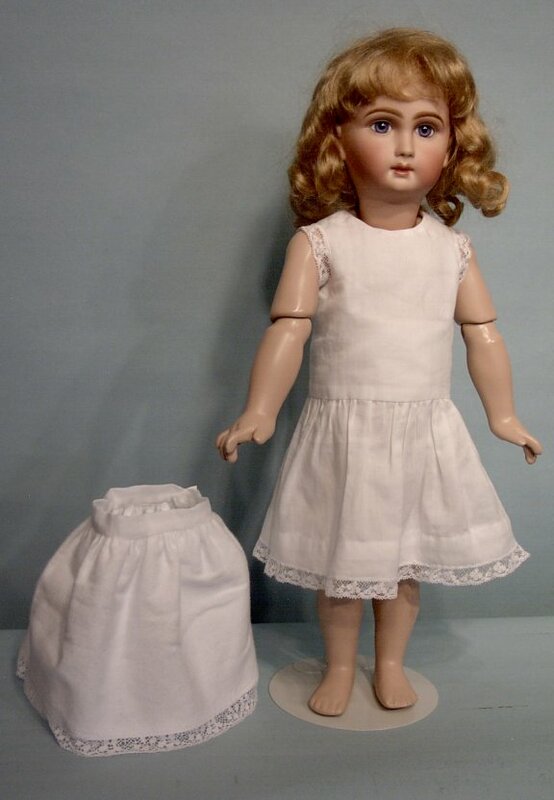 The Nightgown is white cotton that's been trimmed with lace and blue ribbon. The blue flannel Bathrobe has a bias cut self fabric binding around the front of the robe and at the bottom of the sleeves. The Kimono is of a pretty stripe/print loose weave cotton. A light green silk has been used to bind the front of the kimono. The Dressing Sacks are both of flannel. One is a rosebud-strewn flannel, trimmed with bows at the front neck. 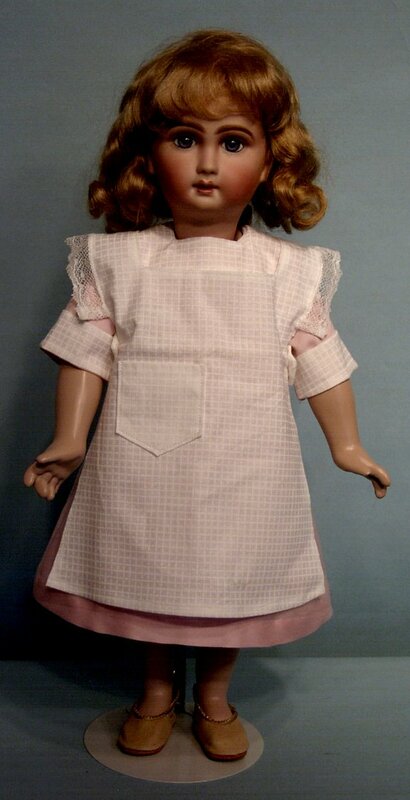 The other Dressing Sack is a pale pink flannel with daisy decoration and ribbon ties at the front. Play Clothes: The bathing suit is white cotton trimmed with red sateen. The rompers are a blue and white check, trimmed with white cotton. These two outfits use some of the same pattern pieces as I'm sure you can tell. 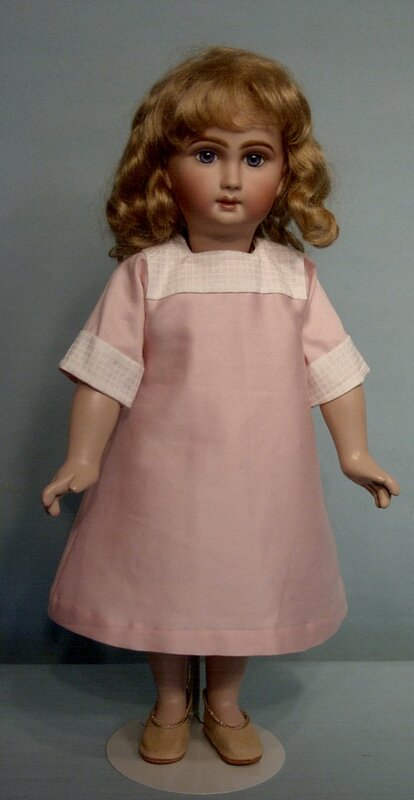 Dresses: The pink dress ("Morning Dress") is of beautiful pink cotton sateen, trimmed with white tone-on-tone cotton. The pinafore is of the same tone-on-tone cotton, trimmed with lace. 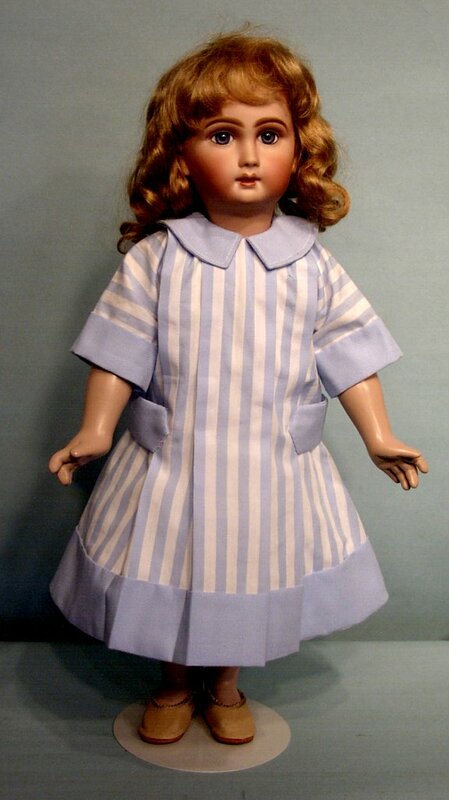 The blue striped dress ("Afternoon Dress") is trimmed with a pale blue cotton. 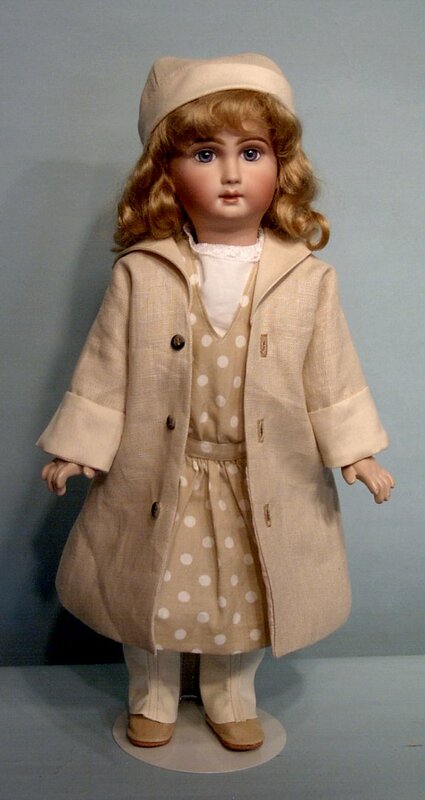 The tan "dress" is actually a white cotton guimpe (or blouse) and a tan and white polka-dot jumper. I used the "Party Dress" pattern for this dress. 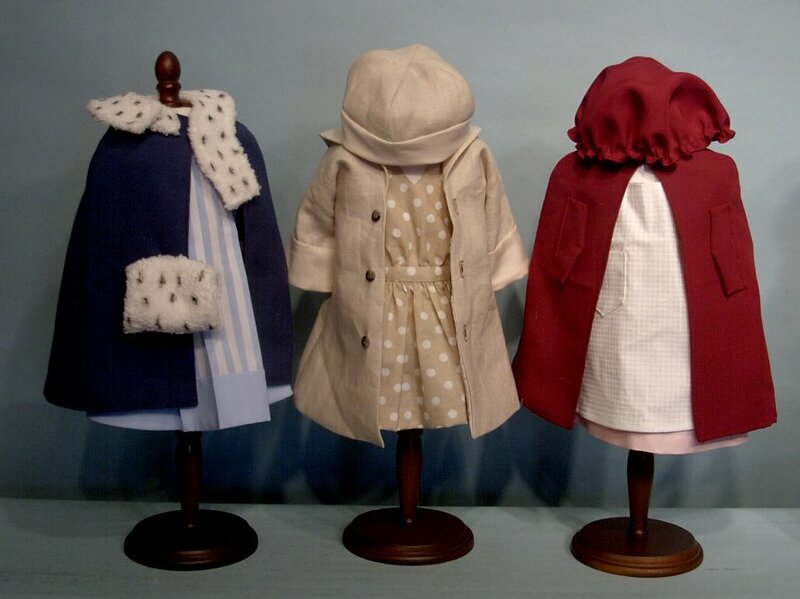 Coats and Hats: Shown first is the Automobile Coat. It's made of a incredibly gorgeous tan linen. I hoard this material and will be so sad when I use the last scrap. 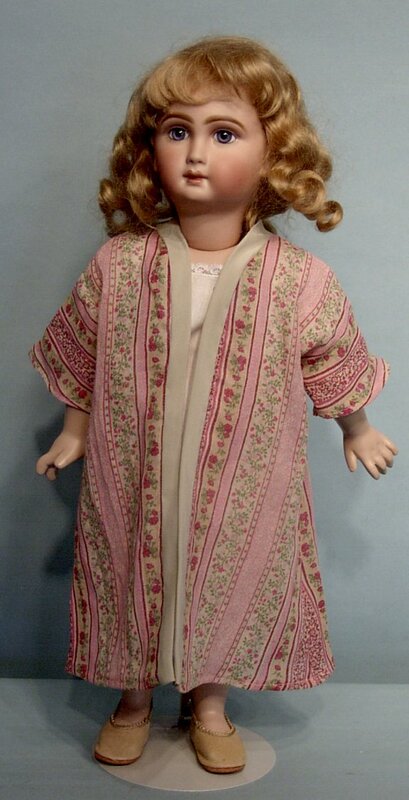 The coat is lined in pale pink charmeuse silk. The coat's collar and cuffs are of a heavier cotton. The Polo Cap is made of the same tan linen and the same heavy cotton. And please note the Leggings! The pattern suggested using leather, but I used Ultrasuede instead....it worked like a dream! 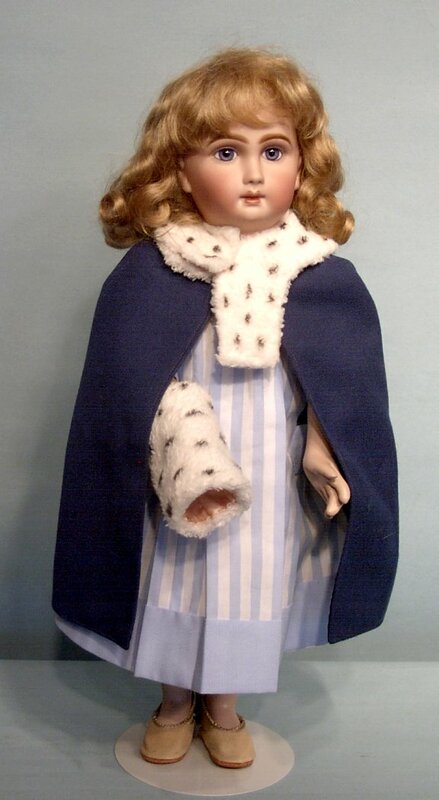 The Fur-Lined Cape in the dark blue wool is actually not fur lined but blue silk lined. I wanted to keep bulk down. The Cape does have a fur collar that matches the Fur Muff and Tippet. The Fur Muff and Tippet are two of my favorite pieces of the Mary Frances wardrobe! 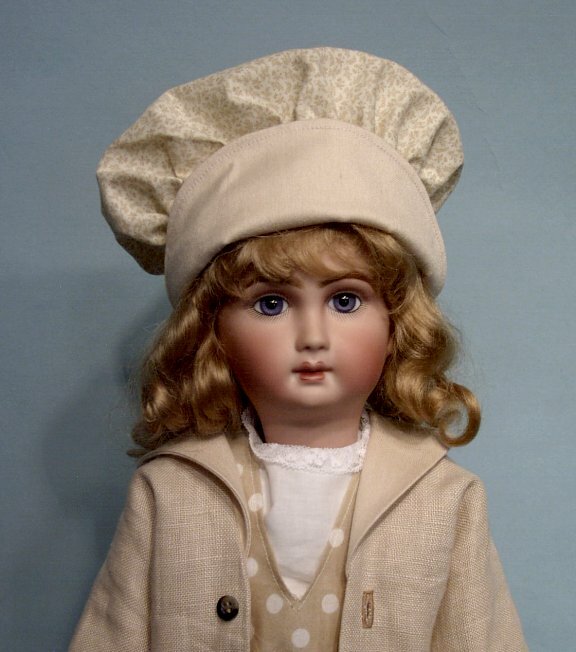 I found some of that so-very-soft bathrobe material that's so popular now ("Minkee"). It had a "furry" appearance. I made the Fur Muff and Tippet out of this plain white "fur" fabric, lining them in pale pink silk. The black "ermine" marks I made with a permanent black marker. I wish I could say that that was my idea but the Mary Frances book suggested something similar in using black ink to make the simulated ermine marks. 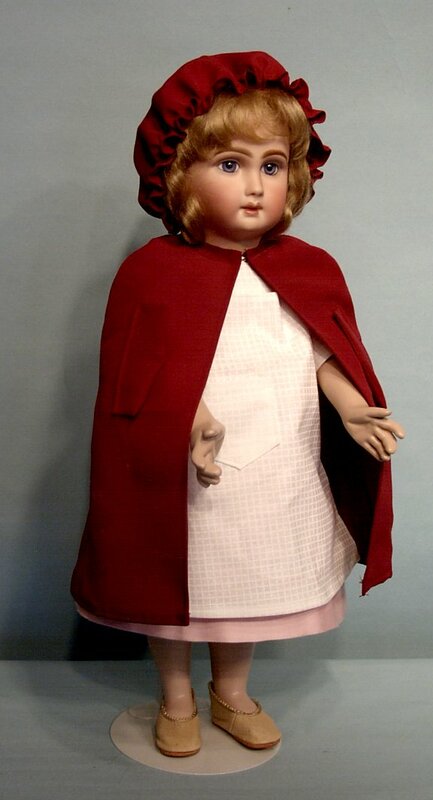 The Rain Coat is of a red rayon faille. The faille is a vintage fabric dating from the late 1950's. The hood is attached to the Rain Coat. 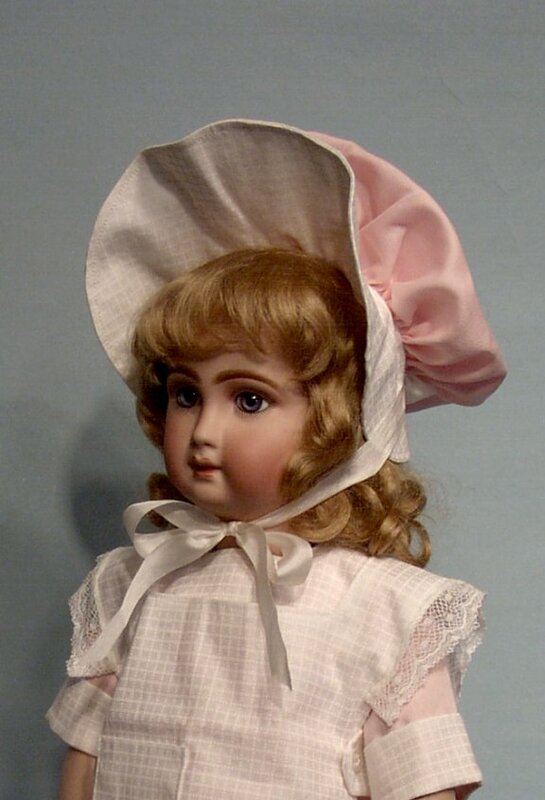 The Sun Bonnet is made of the beautiful pink sateen and tone-on-tone white cotton used for the Morning Dress. There are silk ties. The Automobile Bonnet is made of a small tan flowered print, with the heavy cotton previously used for the Automobile Coat being used for the brim. "Special" Dresses: The Party Dress was shown above in a less fancy cotton, but I made it a second time in a dressier fabric. The guimpe is a delicate pink cotton, trimmed in off-white lace. 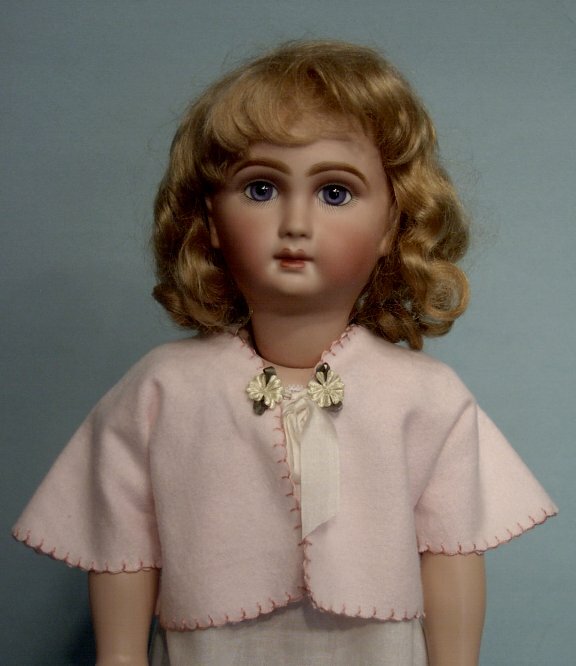 The dress is of pink silk charmeuse, trimmed with multiple laces and silk buds n' bows trim. 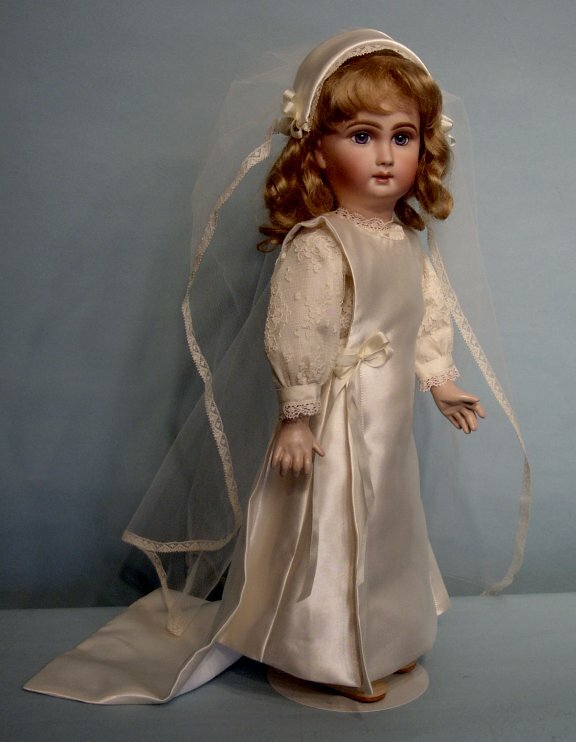 The Wedding Dress is of off-white satin. The guimpe is of an all-over pattern lace with a silk underlining. The veil is my own design...a simple wired headband for the hat and lace-trimmed tulle as the veil. Silk ribbon trims the wedding dress and the veil.